The Detroit Shipping Company is opening in Midtown. The structure, made of Shipping Containers has bars, restaurants, galleries shops and more. 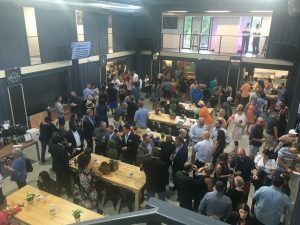 On Wednesday July 11, the Detroit Shipping Company swung open its doors to the public for the first time with a Grand Opening party. People certainly did not leave disappointed. What is the Detroit Shipping Company? The better question might be – what isn’t it? Located at 474 Peterboro Street near Midtown just off Cass Avenue, The Detroit Shipping Company is aptly named because it has been constructed out of recycled shipping containers. Yes, you heard it right – shipping containers. Most people are familiar with shipping containers as what is used to transport freight from China to the United States. On the west coast, there are shipping yards devoted to stocking them after they are unloaded in port. But in an effort to find a use for all things, shipping containers now have multiple diverse uses, including the construction of some homes – including ones locally in Corktown and Royal Oak. The Detroit Shipping Company takes an aesthetically unappealing box and turns it into a modernistic, clean and simple 10,000 square foot consortment that is nothing short of amazing. The inside gathering space at the Detroit Shipping Company contains “hang out” space to dine and drink. Housed in the complex are multiple restaurants, bars, a t-shirt shop, art gallery, podcast studio as well as a coffee and ice cream stop. Think of it as a food truck rally without the trucks plus all kinds of other stuff. Did we mention the outdoor area? 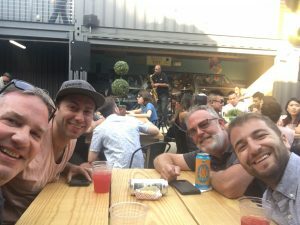 Tucked in the middle of two-stories worth of containers blooms a festive outdoor area that includes a long bar, a performance stage for music or other productions along with tables and chairs. Housed underneath outdoor lights and of course, the sky… an oasis of light and air prevail in the middle of the city. One could not ask for a better beer garden. Day Drinking? Night Drinking? This spot soothes the soul at any time of day. The outdoor area at the Detroit Shipping Company is surrounded by two stories of shipping containers. 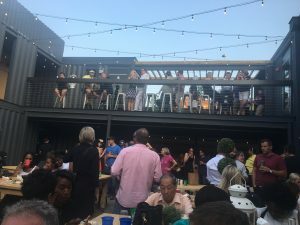 The restaurants at The Detroit Shipping Company are: Bangkok Street Food, Brujo Tacos and Tapas, Coop Chicken Fusion, Bread Meats Bread, and Motor Burger. Honored to be part of the Grand Opening Festivities on July 11, The Michigan Pedaler provided complimentary rides to guests for a quick pedal through Midtown as part of the kickoff celebration. 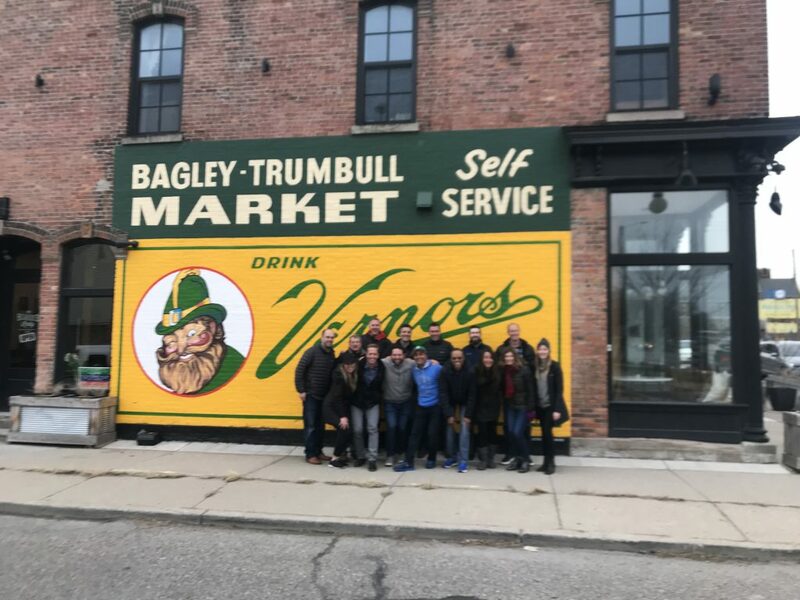 But more importanly, we think future Michigan Pedaler guests are going to love this as one of their stops during their two-hour pedal pub rides. If you book our Midtown route, we’ll make The Detroit Shipping Company one of your stops. It offers something for everyone – a great place to sit outside or inside to grab a drink like many of our pub crawls choose to do. To sit around and drink a beer, the atmosphere is chill but electric. Michigan Pedaler team members soak in and enjoy the atmosphere at the Detroit Shipping Company. Clockwise from left: Mike Gill, D.J. Alvin, Brian Diskin and Nick Popovski. Because the DSC is more than just a bar its broad appeal provides something for everyone. If you are not looking for traditional pub crawl with our bike, this provides a different take or something for everyone in your group, from Grandma down to your 21-year old cousin. It offers a chance to quickly stop in and check out an art gallery, grab an ice cream, or simply admire the architecture of the building itself. Due to the fact that food is prepared quickly, this is one stop where you can actually order up some food and be back on the bike in 15-20 minutes. It’s great to see the landscape of our city change one cool business at a time. 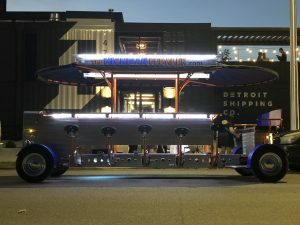 We’re excited to welcome the Detroit Shipping Company to Detroit… and very excited to be provide a special experience to our Michigan Pedaler guests who are looking for a cool, unique and fun place to explore. 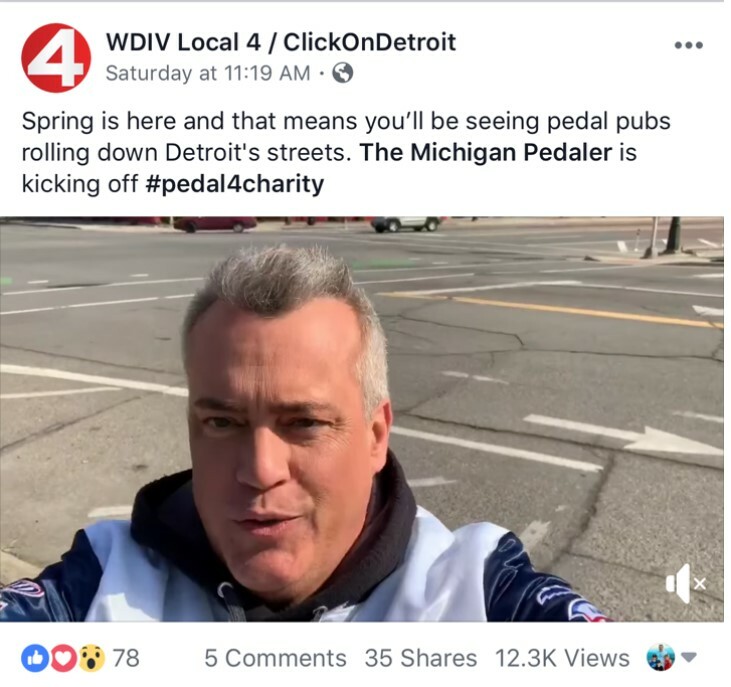 The Michigan Pedaler outside The Detroit Shipping Company on Peterboro.